Premium, one-of-a-kind embroidered cap made from the same authentic Bush Poplin that we use on our Signature Field Shirt. 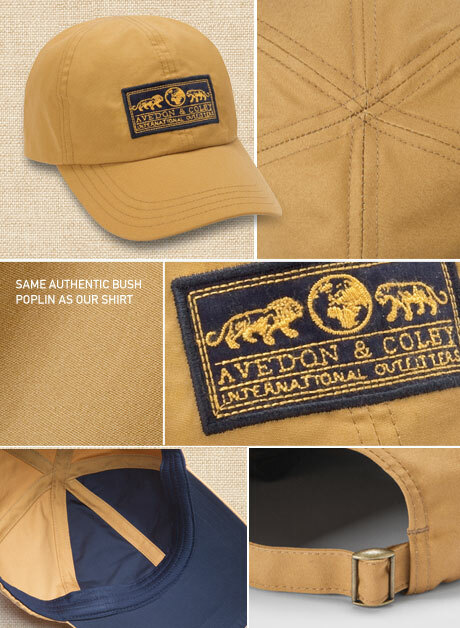 The six-panel, no-button top cap features an adjustable back strap and an "old-style" embroidered Avedon & Colby logo. Design: Sewn from the same British tan Bush Poplin used for our Signature Field Shirt, the six-panel construction and no-button top is ultra comfortable. Sizing: Adjustable back strap with buckle slide makes one-size-fit-all. Details: Fabric-lined brow band offers excellent comfort and the "old-style" needle embroidery for logo looks great!